The initial chapter begins with an explication of Sarah Robbins’s background and the journey to establish her own company. She notes that persistence and commitment to the goals assisted the original founders of the company to get the system running, with resounding success in only four years. A remarkable part of the initial chapter is failing forward, where she notes that many businesses begin with failures or difficulties. Sarah Robbins asserts that success is got through prospecting, a process of seeking the right partners or resources for the company. Indeed, the chapter ends with a postulation that only personal activity ails businesses and challenges readers to work against their odds to success. The second chapter explicates the author’s experience dubbed ‘seven figure success system’ that mentors prospective entrepreneurs. She advocates for networking marketing, arguing for its freedom in operation, the underlying financial gains as well as the fun derived in working and numerous growth opportunities. The author offers a story of a $ 50 million woman who lost an opportunity of becoming a millionaire by quitting the business. She contends that more than 95% of people who have pursued network marketing earnestly have reaped success in the profession. The third chapter challenges the readers to think like CEO’s because network marketing make the entrepreneur an own boss. Robbins notes that people who think of the profession as a business and not a hobby reap huge benefits. It is indeed crucial to establish the blueprint for success in the business which entails setting time frames for operating the business and prioritizing those activities that lead to financial freedom and income. The chapter uses the analogy of a starving baker to restate the fact that amidst many commitments, personal growth and accomplishment should be achieved. Individuals should also seek justification of the activities they do and finding the reasons for doing them will lead to achievement of goals. The fourth chapter concerns promotion of products and the author indicates that value is created when individuals buy from their own stores and test the quality of their products, offering samples to clients and satisfying customers. Robbins believes that although creating a good team is vital, promotion of products is paramount to the success of the entity. The chapter indicates that businesses can attract new clients by hosting publicity events and appreciating them. However, keeping them entails continual follow-ups and using referrals from business partners that allows one even to get new customers. The fifth chapter deals with ‘power prospecting’, a channel for identifying the team for the networking marketing business. The author notes that people for such a team may fit to be customers for the services, consultants for building the business or connectors to other business prospects. The three classes of people can be got from revisiting customer lists, revisiting former business consultants and checking phone or social media contacts. Robbins offers a personal story of how she lost a prospective opportunity by not keeping referrals or contacts of useful people, urging readers not to prejudge people who may prove vital for prospective business opportunities. Chapter six follows from getting the right team to developing your business story. She urges individuals to create their business story based on the gap that they satisfy, the way that the business was found and its goals. Robbins indicates that this process of power prospecting also involves sharing the story directly to close individuals or indirectly through referrals or through lifestyle prospecting and getting the story heard by many people. She notes that in sharing the story with prospective partners, people should focus on the essence of the partnership, their products, pay plans as well as product positioning. Such an approach gets their interest and agreement to the arrangement. The seventh chapter details the power close, attesting that many people are afraid to prospect and present their businesses because they think they do not know enough. Robbins gives advice on offering bonuses to the prospects, attractive pay plans as well as non-monetary incentives such as trips that would make the business more attractive. Using her own experience, she encourages individuals to overlook success hindrances such as lack of time, resources, skills, fear of pyramid schemes or rejection and pursue network marketing. Chapter eight delves on the aspect of effective enrollment of the right individuals in the team and duplication of the streams of income. The author indicates that enrolling the right people is important and teaching them the gist of the business operations. She introduces the aspect of daily activity goals, which should be emulated by businesses to track activity of the new people. She acknowledges that it is vital to ensure that your team remains connected even if the company is dealing with new partners and organizing events such as conferences, summits and recognition parties to maintain the glue within the overall team. The ninth chapter provides guidance to new entrants in the profession from the personal experience of the author. Robbins acknowledges that leaders in the profession should control their ego, exude energy and motivation and encourage the team towards success of the entity. They should also engage team members in decision making, educate them and equip them with the necessary resources to perform their tasks. The leaders should further be ethical in their operations, encourage the team members and exhibit exemplary practices. Robbins finally stresses the aspect of endurance in the face of challenges because every business has hiccups and tough times. The final chapter addresses the power of belief, with the author highlighting that the business was borne out of belief, commitment and dedication to life passions. She attests that words have power, giving the example of her business colleague Nikki, who declared greatness in her endeavors. Robbins asserts that individuals have power to declare success for their businesses, careers and families. She urges people to believe in their dreams and embrace positivity which makes any ambitions to turn to reality. 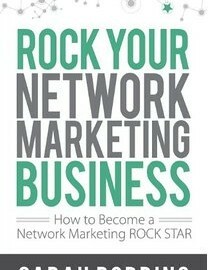 She concludes that network marketing has accomplished her dreams and encourages others to be assertive on their ambitions and become ‘rock stars’ in the profession.